“Beverly Ellen Schoonmaker Alfeld, also known as “Jamlady”, grew up in a commercial-nursery/greenhouse family in Accord, New York. Her early interest in horticulture and cooking were a tremendous influence on her later innovations in canning. 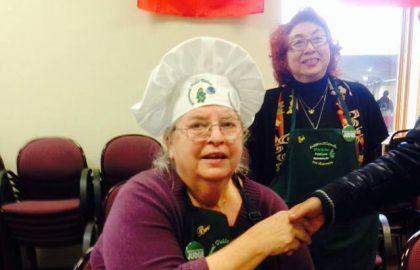 Alfeld is dedicated to educating home cooks on how to can safely. Her creativity and extensive research has led her to assemble innovative recipes. Jamlady’s methods dispel the mysterious aura around home canning and debunk the myth that canning is only for those with extensive leisure time. Alfeld began her post-secondary education by earning a B.A. in art from the State University of New York. She went on to teach elementary school art and spent much of her free time studying plants. She returned to her formal education, earning a M.A. in theoretical and applied design and a M.F.A. in art and textile chemistry from Northern Illinois University. She also completed advanced coursework in the fields of education, administration, and school law. After twenty years of teaching art, science, and consumer education to elementary, high-school, college, and special-needs students, Alfeld retired from the classroom. She explored her entrepreneurial side as she ran a thirteen-acre organic farm and opened a farmers’ market in Crystal Lake, Illinois. During this time, she completed the school of instruction in food processing prescribed by the Food and Drug Administration. Alfeld then founded her company, Cook, Seal, and Process: Purveyors of Fine Preserves and Condiments, and began marketing Jamlady products. 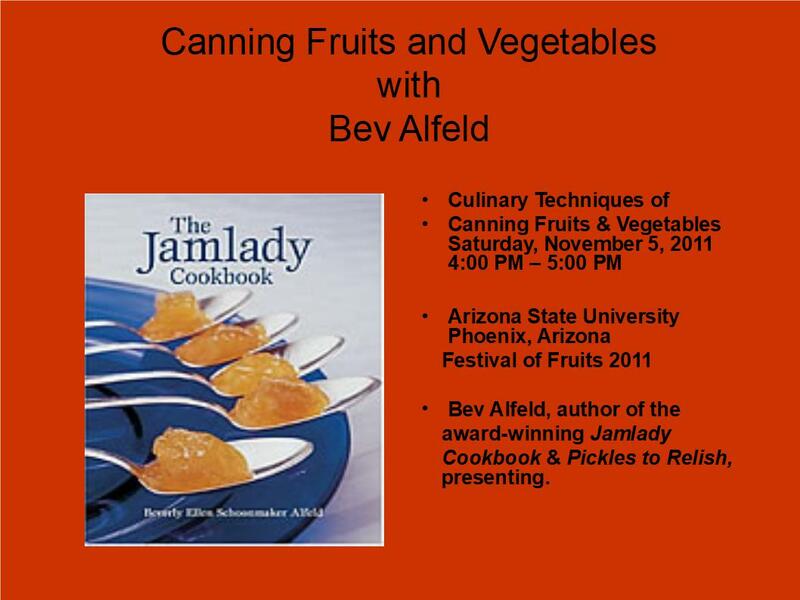 Alfeld later authored “The Jamlady Cookbook”, a resource cookbook for the canner, gardener, gourmet chef, and health-conscious person. The book features more than four hundred recipes for jellies, jams, preserves, butters, and other homemade products. Most recently, Alfred wrote Pickles to Relish, an encyclopedic cookbook with an ethnobotanical approach to cooking, canning, and living.